We know we are sounding like a broken record for saying this over and over again but we are super grateful for all the love and support that we've been receiving for our anniversary month --- and our very own W@W podcast guesting is no exception to this. So without further adieu, we present to you guys our podcast guesting--get to know more about me and Mica, the blog, the Wedding Agency, and well--just simply laugh & have fun with us. Pardon the thousands of times I've probably said "parang" and "uhm" hahahaha. WIN A GIANT PAPER BOUQUET!!! PROMO ALERT! Get a chance to win a beautifully crafted giant paper rose bouquet especially made by freelance crafter Koni Esteban! 1) Simply listen to our podcast from start to finish. CLICK HERE. 2) Answer the following question: What did you learn about the RBs from this podcast? Just leave a POSITIVE comment from this blog OR from the w@w link where our podcast is located. That's it! We will monitor both this RB link & the w@w link from July 11 - July 31. The best answer will win the bouquet. Anyone can join--from brides, to grooms, or even friends of bride-to-bes. 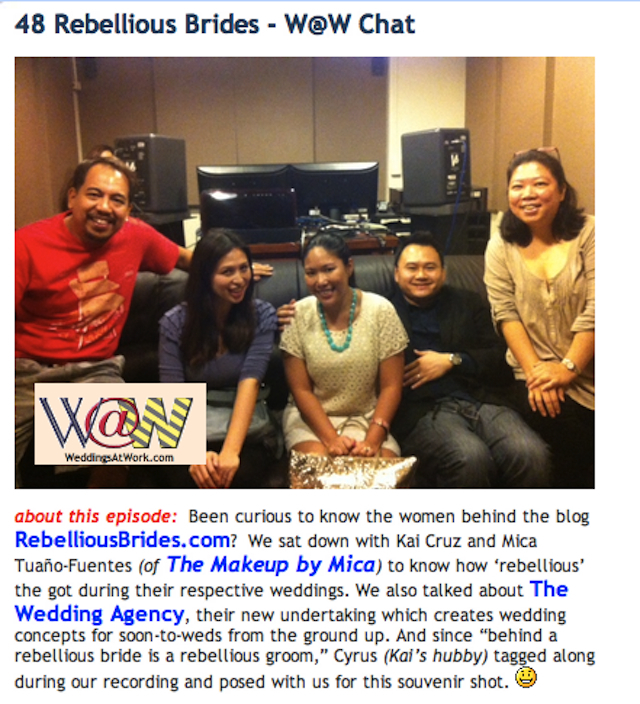 Announcement of the winner will be on Aug. 1, via rebelliousbrides.com and our twitter account. A thousand times THANK YOU, to the W@Wies who requested for us to be guested in the podcast and for Benz & Abet for having us on the show! Once again, listen to the podcast by clicking HERE. Hi RB! Your podcast session is so inspiring. It made me realize that having a dream wedding does not necessarily mean to be expensive and glamorous. What's important is that we both (b&g) enjoy planning for our wedding and just put details that we both love. Doesn't matter what other people say about the outcome. What matters is the we both did what we wanted and had fun on our once in a lifetime wedding day. I'm now so looking forward to celebrating our big day. Sana 2013 na. hehehe More power RB and W@W! 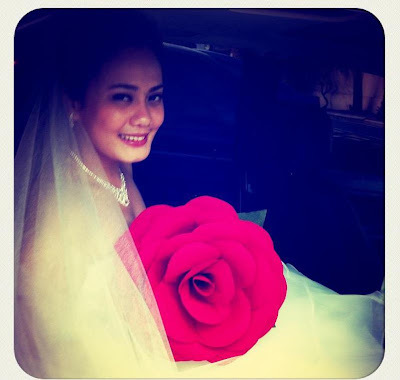 Nakaktuwa nmn ung kwento nyo about your weddings :)Lalo na si Kai, weddings tlga. Hahhaa. Very inspiring ang mga kwento. May kanya kanya taung trip to make our dream wedding possible. Basta ang mahalaga maging happy tau sa wedding natin ang kahit ilang taon na ang lumipas andun pa rin ang fulfillment sa puso natin. I have been listening to W@W chats since I became a member of W@W early this year. It’s nice to know that a wedding resource through a blog created by Filipina brides is readily available for B2Bs (rebellious and not rebellious at that). Listening through the chat for 66 minutes, I did not even notice the numerous “parang” and “uhm” because I was totally enjoying the topic. I would not exactly consider myself as a rebellious bride but with all your “kuwentos” I realized I could have a rebellious streak in me too in a positive way to say the least. I have started a lot of DIY projects and listening to your own experiences made me all the more motivated to finish what I have started. I actually tried creating the giant rose flower after seeing it featured in GWS and it was a huge failure maybe because I used the wrong paper and I don’t know which paper to use exactly. I gave up this task and instead focused on creating another paper flower project (kusudama and some fabric flowers too). Also, my H2B’s brother got married this year and our wedding is set on October. I am not sure if the “sukob” thing is applicable to our situation but we’re both decided to push through (besides he’s not Filipino and sukob is not part of their culture). Anyway, what I learned about the RB W@W chat is that a wedding is something that should be a reflection of the couple’s personality and should not necessarily adhere to traditions all the time. Planning the wedding need not be stressful because there are a ton of blogs and people that are more than willing to help and provide input to make one’s ideas a reality. I am so lucky that my H2B is ever willing to share his input and I really feel that our planning process has been a partnership. Like Kai we will probably have more than one wedding as well (one in General Santos City on October and another one in Denmark so a greater number of his family and friends will be able to attend too). Like Mica we will enjoy our day and just be ourselves with our family and close friends. As early as now, I can feel that our wedding day will be so much fun and a day filled with memories that will last more than a lifetime because we have put our effort into it. Thank you RB for your blog and for being an inspiration to all RB’s out there (count me in!) and of course thank you to Weddings At Work for the myriad of resources and huge help in our preps. Anyway, to get on to the learning. we have learned that on the wedding (from the preps, to the day, the reception, the elements, and etc) is for the couple to celebrate their start of forever. It is the couple's event, it is their occasion., it is their day. "The couple is always right". They don't need to always conform with the all traditions; they can choose anything on the wedding that is reflective of their own personalities, or they can just do the stuffs "with a twist". Wedding preps and of course, the event day, should be fun, not negatively stressful. Don't know how to start? - there are thousands of free resources available in the net - W@W and RB are just two examples. Plus, people around you are getting married as well - your friends, your co-workers, your kapit-bahay. Get to know them and talk about how they did their wedding. You might get supplier referrals and discounts. You don't need to do everything in your wedding by yourselves. There are people who can help - your family, friends, and of course, the pros. The couple should be assertive of their wants. Non-negotiable items must be non-negotiable. Though it is right to get the inputs of others, let's say from parents, but these inputs should only be taken as "suggestions" and not as necessity. Do not be concerned if your wants may not be what is "usual" or traditional, or if others may badly comment about it. It just doesn't feel good if you agree on so-called tradition if you yourselves want something different. Be assertive but be reasonable at the same time. Do not let yourselves be bullied. Remember, it is your day. Besides, the stuffs that you do differently in your wedding will be the stuffs that your guests will never forget about your wedding. Being "rebellious" does not mean being 100% against tradition. It is neither negative nor overly defiant. It is just a putting your own personalities into your wedding. The bottom-line is, it is your wedding, it is your event, it should be your style. Today I’ve been married for exactly 2 months..Yey! I have been a fan of your blog and Mica since January when I was searching for new ideas. To be honest, my wedding gown was inspired by Mica’s. I hope you don’t mind. Thanks Kai for introducing me to your personal blog, through this podcast, as well! It’s wonderful, colorful and I love the songs from your Oh Happy Day post!! Anyway, what I’ve learned from listening to your podcast: “concept” is that important in one’s wedding. I never had one, I never asked anyone for a full coordination of my wedding day. I had so many ideas from all the blogs I visited but none actually worked. Good thing, I have supportive friends as well who helped me with the whole wedding preparations. My husband wanted it tame but I wanted a “wedding. I won but there are dramas along the way. Yay! :-) Thank you soooooo much!